The Berti mulcher range has been a champion performer in New Zealand farming conditions for over 20 years. In this time, Berti has bred loyalty from farmers and contractors who have put this sturdy gobbler to the test. Berti mulchers don’t just lop off tops, they get to the root of the problem. 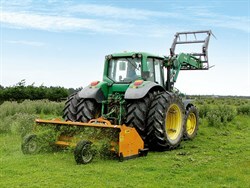 Berti mulchers increase farm production by producing better pasture and by bringing wasteland into production. It tops pasture at high speed, leaving a fine mulch, with no build up of windrows. All Brown Top, Cocksfoot, and other low-producing grasses are eliminated to allow high-producing grass to rejuvenate. Gorse and scrub are chopped in one pass for a quick return of wasteland into pasture. It's more effective than spraying and much cheaper, as many farmers, including Nick Seddon from Kaikoura, have proved. Seddon has been using Berti mulchers for 10 years to clear more than 100ha of gorse-covered rolling hills on his property. He weighed up the option of spraying but decided the mulcher would give him a better chance of keeping ahead of the regrowth. The result has meant an increase in production and better pastures for his sheep and cattle on the gorse-affected paddocks. "We've got the pasture back again. The gorse is still there and the grass grows up through the gorse once it's been mulched, so it's good cattle fodder, as opposed to having nine-foot-high gorse bushes everywhere. Now it's just a repeat every year to keep it all mowed and in check," says Seddon. 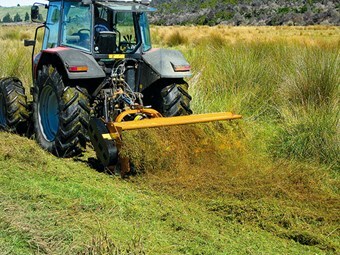 Berti becomes a multi-functional tool on the farm by reducing rushes and wiping out thistles to a fine mulch that breaks down quickly and allows rapid regrowth of pasture. The Berti also mulches crop residues, gorse, tussocks, broom, and matagouri. If you are unlucky enough to be plagued with Kikuya grass, both the Hammer Flail and Y Flail units are recommended by the Kikuyu Action Group. Chairman of the group, Northland dairy farmer Murray Jagger has worked Kikuyu grass for 20 years and says, "Five years ago we got a small Berti model and now have moved onto a two-metre-wide Berti TBM super mulcher." Berti features a heavy-duty RHS A-frame and its double row, self-aligning bearings on a 60mm stub shaft, makes it one of the heaviest in the industry. Its high-speed rotor (2300rpm) is the only rotor on the market with drop-forged flail lugs for added strength and durability. Canterbury farmer Bill Wilson uses his Berti TSB 300 to top paddocks on very stony ground, saying the stones don't affect it like an ordinary mower. Wilson has nothing but praise for the Berti mulcher. "We had a paddock of Horehound and I used it on that, in amongst stones and it's done a fantastic job. It's working very well," he says. With the bearings fully-embedded in the rotor, this cost effective machine keeps maintenance costs low by providing maximum protection from moisture and from dangerous foreign objects, such as wire. It also features a double skin in the mulching chamber for rigidity and protection of the outer skin. Contractors are impressed with Berti's durability, says the company. Northland contractor Don Lilly, from Kaitaia, is convinced Berti mulchers are the most robust and easy-to-operate mulchers he's seen. "As long as you keep them well-maintained and greased, they just go and go. We can do a hectare an hour with topping in a reasonably-shaped paddock." Berti also features a fully-adjustable tailgate, a pre-chamber that creates the venturi effect for more-effective cutting, and has the longest skids of any mulcher on the market, according to the company, providing excellent ground contour tracking. Berti's impact on increased production is manifold. It eliminates dead grass at the base of sward that can stunt regrowth and it prevents reseeding of weeds. In turn, this can reduce ryegrass staggers, prevent spring pasture deterioration and stock feed on more palatable pasture. According to the company, topping with a Berti in spring is best practice for milk solid increases from January to March. For more information contact Farmgard on (09) 275 5555 or (03) 437 9000 or visit farmgard.co.nz.